In 1996, the Glassboro Fire Department proudly celebrated it’s 100th anniversary. During the course of the last century, over 250 volunteers have served the community. The Glassboro Fire Department plays a vital role in our community while saving taxypayers money. We have a rich history of tradition and excellence. The present fire department is the outgrowth of the early Glassboro Hose and Ladder Company. The first piece of apparatus was a horse drawn ladder wagon that was placed into service May 26, 1894. In those early years, the first citizen to reach the fire station with a horse to pull the wagon was paid $1.00 per fire. Initially, the ladder wagon was housed in the building on the grounds of the Whitney Glassworks, known as the “Mule Barn.” In late 1895, a two-story structure, called Fireman’s Hall was erected on the south side of High Street between Academy and Main St., roughly across from the present Heritage Glass Museum. Shown here are Ira Carter, Alanzo Beckett, Frank Haight, William Porch and Charles Haight. With only one piece of apparatus, no water system, and a small group of unorganized volunteers, there was a fear of great conflagration in Glassboro. The large Whitney Glass Works fire on October 26, 1895 proved these fears to be well founded. Shortly after the Whitney fire, a public meeting was called for the purpose of forming a more ogragnized fire company. There were only about a dozen citizens present, but they were determiend to improve the town’s fire fighting ability. Nine days before Christmas in 1896, Chief Harry Rowan, Sr. presided over the first meeting of the reorganized fire company at Fireman’s Hall. This was the official beginning of the present Glassboro Fire Department. The membership in 1896 consisted of 33 men. 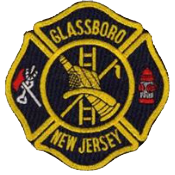 The original “Glassboro Hose and Ladder Company” was maintained until january 6, 1911, at which time it was changed to “Glassboro Fire Compay No. 1” and later to “Glassboro Fire Department, Company No.1.” Here members dress up for their “old time photo” with the newly restored hose cart. Pictured are W. Carey, T. Buck, A. Wilt, E. Custer. J. Keller, L. Kirkpatrick, and G. Armstrong.